This article is about the god. For the book, see Sithis (book). Sithis has mysterious and varying relationships with other spirits. Sheogorath is described as the " 'Sithis-shaped hole' of the world", likely referring to Sheogorath's chaotic nature. 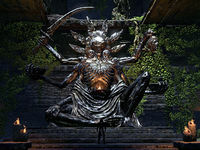 His relationship with Mephala is especially significant; the Morag Tong having worshipped both Mephala and Sithis, the Night Mother of the Dark Brotherhood believed by many to be Mephala disguised. Though many Daedra are believed to have been influenced more by Sithis than Anuiel, no other Daedra are quite so directly associated with him/it. Spoken of as one of the first and strongest Daedric Princes, Mephala may be the only Daedra to actually commune with Sithis in some form. In addition to being the Patron of the Dark Brotherhood, almost all of the races heed Sithis in some form, its existence even acknowledged by the sentient Hist trees. Additionally, Argonians have ties with Sithis: in the Shadowscale tradition, any Argonian born in the Shadow birthsign is presented to the Dark Brotherhood at birth and trained in the art of assassination. If they reach a certain age, the Shadowscales then fully enter into the Dark Brotherhood and begin a life-long service to Sithis. The Ghost Snake is thought to bear some relation to Sithis. ^ Teinaava's dialogue in Oblivion. ^ Veezara's dialogue in Skyrim. This page was last modified on 24 February 2019, at 10:39.